Head and Neck Cancer Support Group for Bedfordshire, Hertfordshire and Buckinghamshire based at the Luton and Dunstable Hospital Macmillan Centre. Meet people like yourself in a relaxed atmosphere. Bring a friend or carer if you like. Stop by for a chat with others. Cakes to try ahead of the Cake Sale. Also something special for the BBQ. Head & Neck Cancer Treatment. Ian Aitken will update us on cake sale 21st September. Ian Aitken will be updating the group on the plans for the cake sale now to be held 21st September. We have been asked to assist in compiling a list of questions for a proposed patient survey. We would like to discuss this at the meeting. We are hoping to hear from Trevor Hutson about his recent role in a video Macmillan are Producing. If anyone has any ideas for speakers or activities for the coming year we would like to discuss them. New members are very welcome to come to the party. We will meet at the same time 7pm. You will be welcome even if its your first visit. at the Rugby club to start 7pm as usual. 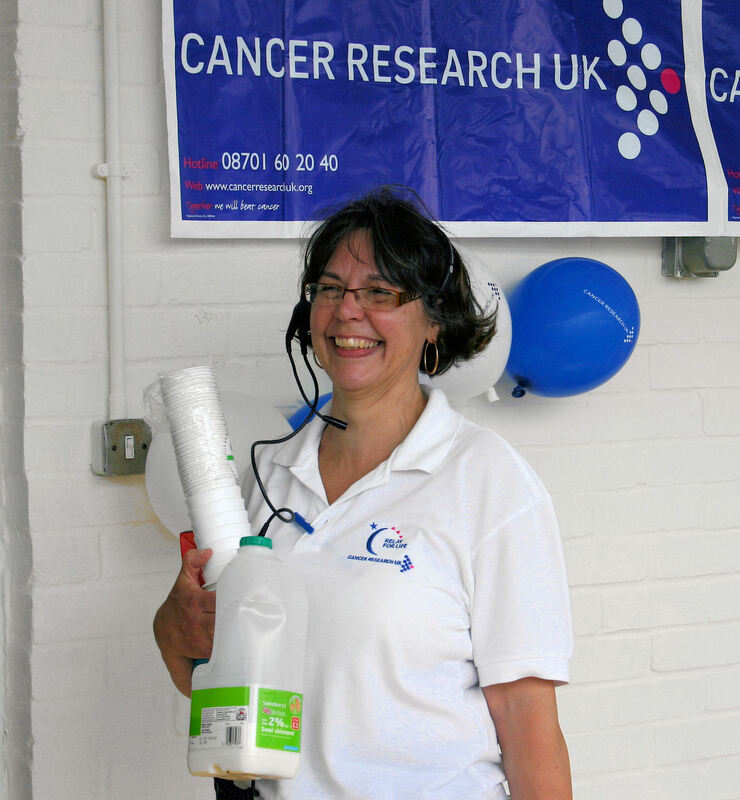 Alan has secured us a speaker, Andrea O�Brien who is the Legacy Relationship Manager for Cancer Research UK. She will be updating us on research especially as it relates to Head and Neck Cancer. Amanda Naylor is leaving and we want to give her a good send off. Amanda is coming on the 2nd and it will be our last chance to give her a send off. We have cake and a present. It would be nice if as many people as possible could come over and wish her well for all she has done for us. In order to give our generous hosts a break the first meeting in 2016 will be on the 3rd of February. There will not be January Meeting. It�s that time again. The Head and Neck Group�s Xmas Party will be at the Rugby Club Wednesday 9th December 2015 at 7pm. You are all invited even if you haven't been before. K-T Martinelli will be stopping by to chat to us about diet and eating issues..
K-T's visits are always enlightening and her direct and open approach usually gets a good discussion going. Suzanne Edgington, Holistic Therapist, Naturopath & Bodyworker. can help cope with loss as well as general well being. presentation. No need to book. Thomas is working with laryngectomy patients using music to assist voice rehabilitation. Thomas will be speaking about this pioneering work. Please come and show your support for this project. Our first meeting of the new year will be on Wednesday the 7th of January. Think of it as an opportunity to wear your new Xmas Jumper & Socks. Everyone is welcome. Bring someone with you if you like. Please consider attending. New members are very welcome. Marie Browne (Macmillan Specialist Psychotherapist) has very kindly agreed to speak at our July meeting, about psychological issues. We have invited John Pickles to attend the 4th of June meeting (7pm) as we intend to make a small presentation to him as a mark of our appreciation. Suzanne offers practical advice for both the patient and carer along with techniques and therapies designed to benefit mentally, physically and emotionally. Matt will be dropping by to tell us all about the Macmillan Exercise Programme. The pilot scheme is a one year project funded by Macmillan Cancer Support and delivered by Active Luton. It is based on evidence* that demonstrates that physical activity during and after cancer treatment is associated with improved physical and emotional wellbeing, as well as reducing the risk of other associated health conditions and of some cancers recurring. which is New Years Day. K-T Martinelli, who most of you will know as the Head and Neck oncology dietician, will be stopping by to chat to us. K-T was also the driving force behind a campaign to have a soft ice cream machine installed on ward 20 at the L&D where many of you were treated. Rob Bunyan will lead a discussion on Oral Hygiene and Dental care following treatment for Head and Neck Cancer. Rob Bunyan is an Associate Specialist Oral & Maxillofacial Surgery at the L&D. The welcome return of the very popular Complementary Therapists based at Luton's Barnfield College. Get there early. It is always busy. Karina Chamberlain (Macmillan Welfare Advisor) has very kindly agreed to come to speak to us about the changes in welfare benefits. Pampered Chef � Cookery and product demo fundraiser � 10% of sales will be returned as funds for the group. Marisa Richards (Commissioning Manager Cancer NHS Bedfordshire and Luton) Will seeking your views on Radiotherapy treatment in the region. This month Fiona Ritchie of RIS Products will be returning. Fiona will talk to the group about her company�s Dry Mouth and Oral Care Products. Louise Bolton (Macmillan CNS) will be along to give us an overview of �The Cancer and Exercise" pilot scheme which is starting this month as a joint initiative between Active Luton and Macmillan. Christine Piff Founder/Chief Executive and Project Manager Fiona Ritchie both of Lets Face It have been invited to talk about their work. This Month there is a return match between the Head and Neck Club Members various ailments and the Complementary Therapist's Team from Barnfield College. A Team of five students currently being tutored at the college will teach us how to relax and will also do battle against our aches and sprains . This is always a well attended event so make sure you turn up for what is usually the most talked about of all our meetings . Expect to get hands on experience of complimentary massage and relaxation techniques. Have your say or learn from others. This Month Connor, Sam, Aran, and Seb fresh from their successful Iron Man Triathlon will be along to present a significant cheque to John Pickles (the L&D's Medical Director) who will accept it on behalf of the Ward 20 charitable fund. This Month we are pleased to be having a repeat visit from the Complementary therapist Tutor at Barnfield College along with five of the students in her care. Their last visit is one of the most talked about meetings of all time. Expect to get hands on experience of complimentary massage and relaxation techniques. Anil Garcia was unable to attend in March as planed so we moved this important discussion back to April. Please attend your view is important. following Cancer treatment will attend. Sam Hunt will be along to tell us about his group of four who will be attempting to complete a Half-Triathlon in the Luton Harpenden Area on the 22nd of December. They will be raising funds for the Head and Neck Cancer Unit. Guest Speaker Sue Semper, who is the Macmillan Mount Vernon Cancer Network (MVCN) Cancer Survivorship Lead and Carol Glover will be presenting the National Cancer Survivorship Programme. Please consider attending new members are very welcome. Rob Bunyan will lead a discussion on Oral Hygiene and Dental care for Head and Neck Cancer patients. The Luton and Dunstable Head and Neck Social Group is an informal gathering of individuals and carers that have been affected by cancer to the head or neck. Our aim is to share experiences and support each other. We can help you if you come and you can help us by coming. Everyone is welcome regardless of where you were treated. Please consider coming you will be made welcome. 1st Wednesday of each Month at The Luton Rugby Club. Click here for Details. For those of you who haven't seen our email rather than holding a party at the Rugby Club this year we are hosting a meal at the White Lion in Dunstable. There is still time to book the cost per head is �26. For the 5th December meeting Peter will be bringing a selection of Goodies. Peter has a lo0ng standing relationship with his favourite delicatessen Walkers of Leicester. They will be shutting up shop after Xmas and as a gesture to Peter they will over the weekend be donating Mince Pies, Savoury Pies, Cheese and Chutney. With great sadness we have to announce that our friend Matt James passed away at Willen Hospice on the evening of Friday 12th of January. Matt had a secondary cancer and despite advanced treatment he did not survive it. Matt�s Funeral will be at the Oak Chapel, Crownhill Crematorium, Dansteed Way, Milton Keynes, MK8 0AH at 10 am on Thursday 1st of February 2018. Following the service there will be a Wake held at the Scot Sports Club Selbourne Avenue Bletchley, Milton Keynes, MK3 5BX. The club is roughly five miles South of the Crematorium in Bletchley. As usual there won't be a meeting on the first Wednesday of December as we will hold our Xmas Party on the 13th. Karen will put together a very basic buffet. 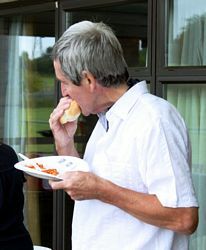 As we do at the BBQ can you please bring something that you like to eat and bring a little more to share with the rest of the group. Don�t try to feed everyone we just want to end up with a really good selection. Please let Derek know what you are bringing and we will try to keep everyone updated by email. If you want to put your marker on something let us know as soon as. We will also need paper plates, plastic cutlery, serviettes and the like. If anyone already has them to bring please let Derek know. Along with Karen�s annual Xmas Quiz we have some extra entertainment for you. Following his recent sold out tour of Milton Keynes & Bletchley Trevor Hutson has bravely agreed to put on a half hour stage show for us. 1st Prize is a Wicker of Wine and Spirits. We have filled a Wicker Basket with Gin, Whiskey, Prosecco, Red, White and Sparkling Wine. If you take it easy it should see well into the new year. Second Prize in the in the Tombola will be a Bucket of Beer. A great selection of Beers to see you and your visitors over the holiday. Could you all please consider bringing something for the tombola so we can raise some funds to make a donation to the Rugby Club. You can wrap it if you wish it to be anonymous. You are welcome to bring someone, a friend, a carer, family or partner. All we ask is that you confirm in advance. We look forward to seeing you all on the 13th. Should be a good night. We have been emailing regularly but I understand some of you are not getting them. Please look in your spam folder. Many thanks to all those from the Group that gave up their time to bake and run the stall. We had a great response for L&D staff who baked and donated cakes to the sale which was a huge success. Altogether Ian and his crew raised a total of �532.58 for the ward 20 fund. The total included two donations from supporters on the day for which we are very thankful. It was a great day they sold out of everything on the stall. Which means they have a pretty tough record to beat next time out. The End of Summer BBQ is on Wednesday the 6th of September this year. Same plans as before. The Group will provide Bletchley Royal Sausages, Burgers, Buns, Onions and Sauces. We ask you to bring some food that you like to eat and share it with the group. No need to try and feed everyone just bring something along and some of us will dip into it I'm sure. We will have a raffle the first prize this year will be a Picnic Hamper full of good stuff to eat and drink. What a great excuse for a good day out. If you can see your way to bringing a present for a raffle prize that would help us raise funds. You are welcome to bring family, friends or carers. We usually number about 30 so we have plenty more room. We have the veranda and the big room at the Rugby Club so if the weather is bad it won't stop play. We will be looking for confirmation closer to the day so we can plan in advance for the food. We will meet at the same time 7pm. You will be welcome even if its your first visit. Email web@hansg.co.uk if you would like to be met by one of the group. Wednesday 5th July 2017 7pm for 7:30pm Luton Rugby Club Newlands road. Jenny Hunt has arranged for Sarah Cullip and Monique Hinds to present a new talk entitled Altered Eating after Head & Neck Cancer Treatment. This new presentation represents a change of focus from the original Moving on from the Cancer Workshops presentations. Sarah and Monique are very keen to get Head and Neck Group Member�s feedback (old and new). It would be good if you could make a special effort to attend as the feedback only you guys can give will mean better outcomes for those following in your footsteps. Louis Kasmin is David Shane�s Grandson some of you will have met him before. By way of a tribute to his Grandfather Louis is taking part in the Do it for Charity London to Brighton Cycle Ride. In doing so Louis is raising Money for the Head and Neck Cancer Social Group. If you would like to support Louis he has Go Fund Me page where you can pledge some money if you wish to support him. Beach Casting have been commissioned by Macmillan produce a new television advert to raise awareness for the support Macmillan provide. They are looking for people who are willing to share personal stories about how they and their loved ones have been affected by cancer. They would especially like to hear from people who have benefited from the care provided by Macmillan Nurses and about how this has helped them cope under such difficult circumstances. It�s that time again. The Head and Neck Group�s Xmas Party will be at the Rugby Club Wednesday 14th December 2016 at 7pm. Xmas Party Wednesday 14th December 2016 7pm Update. Catering is going to be a little different this year. More of a DIY affair. Mat and Karen will be bringing a very basic buffet. Daphne will top it up with her usual quality selection of sweet stuff (including Trifle we hope). As we did at the BBQ can you please bring something that you like to eat and bring a little more to share with the rest of the group. Don�t try to feed everyone we just want to end up with a really good selection. Please let Derek know what you are bringing and we will try to keep everyone updated by email. If you want to put your marker on something let us know as soon as. Hugh will bring a CD player and some Xmas songs for background music. Some of you will know that we now have our own in house magician in the shape of Trevor Hutson. Trevor has bravely agreed to put on a half hour stage show for us. We may also have a prize raffle if we can get it organised in time. You are welcome to bring someone, a friend, a carer, family or partner. All we ask is that you confirm in advance. We can fit about 30 in the small room and if we are likely to get more we will have to let the staff know quickly. We look forward to seeing you all on the 14th. Should be a good night. We have been emailing regularly but I understand some of you are not getting them. Please look in you spam folder. Email web@hansg.co.uk if you have any questions. If you haven't confirmed yet there is still a short window to do so. We will meet at the same time 7pm. You will be welcome even if its your first visit. Sadly Amanda Naylor is leaving the L&D and we want to give her a good send off. Amanda is coming the the meeting on the 2nd and it will be our last chance to give her a send off. We have cake and a present. It would be nice if as many people as possible could come over and wish her well for all the good work she has done for us. There is a licensed bar which will also serve tea and coffee if preferred. We have put on a buffet to suit members which will also include soup. We have a Quiz arranged along with at least one game of Bingo. As usual we have also arranged a Raffle / Tombola for which there will be a good first prize but we also ask members to bring a small prize with them so we can have more winners. All we ask is that you please let us know soonest if you are attending and how many are in your party so we can ensure there is enough food and no waste. K-T Martinelli, who most of you will know as the Head a nd Neck oncology dietician will be stopping by to chat to us. K-T was also the driving force behind the successful campaign to have a soft ice cream machine installed on ward 20 at the L&D where many of you were treated. K-T's visits are always enlightening and her direct and open approach usually gets a great discussion going. Suzanne Edgington returns this month to explain how CranioSacral Therapy (CST), a whole body evaluation and therapy, can help cope with loss as well as general well being. situations and emotional stresses. Loss of a job, a marriage, a limb, an old lifestyle or life, a pet, a partner, a car, your childhood, your youth, or perhaps a previous way of life. CST is an alternative approach to safely supporting someone through these emotional stresses when they are beginning to have a negative impact on their life. It is a helpful alternative to counselling where speaking can be part of the therapy but not necessary to get a beneficial result. Supportive touch is offered but the treatment is completely patient/client lead, a supportive space is held and touch is only applied when the patient/client is ready. We are happy to open the evening to all Cancer Patients and their carers or indeed anyone who might benefit from the presentation. You will be welcome No Need to Book. Dr Thomas Moors is a doctor from Belgium with a special interest in voice pathology, or more specifically, voice rehabilitation for laryngectomy patients. He was a member of a Belgian boys' choir for over 15 years, has had international voice training, and recently passed the Choir Conduction Course at the IOE University London. He combines his passion for singing with his medical background. 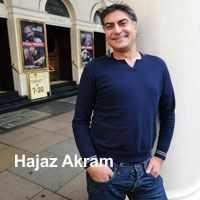 Together with a team of Speech and Language Therapists, oper a singer LaVerne Williams, and actor Hajaz Akram (principle of the Hampstead Academy of Acting and Drama), he has developed a new method for tracheoesophageal voice rehabilitation. We had a good time on Wednesday Night. 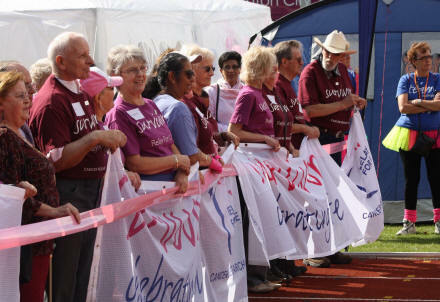 This year we had guests from the Leighton & Linslade Cancer Support Group as well as our own crowd and Hospital Guests. There were a few people we missed this year who were unable to come on the night hopefully we will see them again shortly. Alan took some pictures and we will hopefully have something to post shortly. We have to take time to thank Karen for organising the quiz and the bingo which was great fun. Matt for Borrowing a Mini Bus and Chauffeuring the L&L visitors on the night. 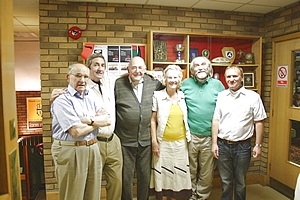 The Rugby Club for donating the room and a big bottle of Fizz (amongst other stuff). Diane who organised the food for us, Alan for beating people up to buy raffle tickets. Everyone that bought a prize for the raffle and of course Daphne for the Xmas Trifle. We will be back at the Rugby Club on the 7th of January at 7pm, see you there hopefully. Have a Great Xmas and New Year. Our apologies if you have been on here looking for more details of the party. We had a technical problem that resulted in us being unable to make the changes visible to everyone. Thanks to the generosity of Luton Rugby Club we will hold the annual party again at the Club in Newlands Road, Luton which is just off Junction 10 of the M1. We have a food, a quiz, hopefully a couple of games of Bingo, our raffle (so bring some money) and a full bar till around 10:15. If you haven't confirmed yet we still have room for a few more people. Please let us know. The Social Group BBQ went very well thanks the the efforts of a number of volunteers who spent most of the event providing food for others. We have some pictures of the day but we would be happy to add any others if you email them in to web@hansg.co.uk. BBQ and Soft Food Party 1Pm-2pm Sunday 13th July at Luton Rugby Club in Newlands Road Luton. The Head and Neck social Group would like to invite Members, New Patients, Carers and Family to an informal BBQ at our usual venue Luton Rugby Club. The party starts at 1pm on the 13th of July till around 3pm. There will be a mixture of food available to suit most patients. Children are welcome there is plenty of room for them to run around. 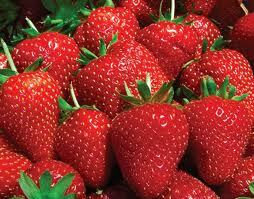 The weather won�t stop play as we have plenty of shelter available and the BBQ won�t get wet. There is no charge its absolutely free but we do need to know in advance who is coming so we can be sure to feed you properly. Please email web@hansg.co.uk. Oh and the Rugby Club will have a full licensed bar with soft drinks or tea and coffee also available. Marie has very kindly agreed to speak at our 2nd July meeting, about psychological issues. A number of our members have good reason to recall John Pickles as their consultant surgeon at a time when they desperately needed to be in safe hands. 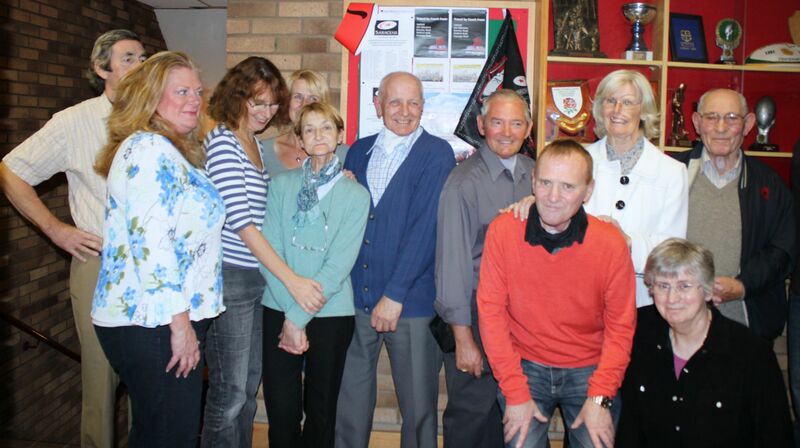 Recently John announced his retirement and a number of members felt it would be fit ting to mark the occasion. To that end we have invited John Pickles to attend the 4th of June meeting (7pm) as we intend to make a small presentation to him as a mark of appreciation. Even if you are not a Head and Neck cancer patient, perhaps one of his many ENT successes you are welcome to come and toast John Pickles with us on the 4th. Suzanne has been practising since 1996 and will being talking at the next Head & Neck Social Group Meeting Luton on Wednesday 5th March 2014. Suzanne has recent personal experience of supporting her husband through the processes of a Head & Neck Cancer and is coming to share her story. She will also talk about how some of the therapies she practises, such as Craniosacral Therapy, Massage, Lymphatic Drainage, Acupuncture, EFT, Nutrition and Meditation might benefit those going through treatment for and moving on from cancer. Luton residents who have had or are currently receiving treatment for cancer can take advantage of a new exercise programme led by Active Luton. The Cancer and Physical Activity Pilot will be running for a year and offer a variety of exercise activities. Funded by Macmillan Cancer Support, the pilot will be run predominantly from the new Lewsey Sports Park, with a variety of wet and dry side activities on offer. Staff at the centre will be working closely with Macmillan nurses and experts from Luton and Dunstable hospital to deliver specific exercise programmes which will cater to each individual�s needs. For the more hardy of our members there will be a meeting at the Rugby Club on the 8th of January not on New Years Day. Should be a good opportunity to have a quite chat round the table. 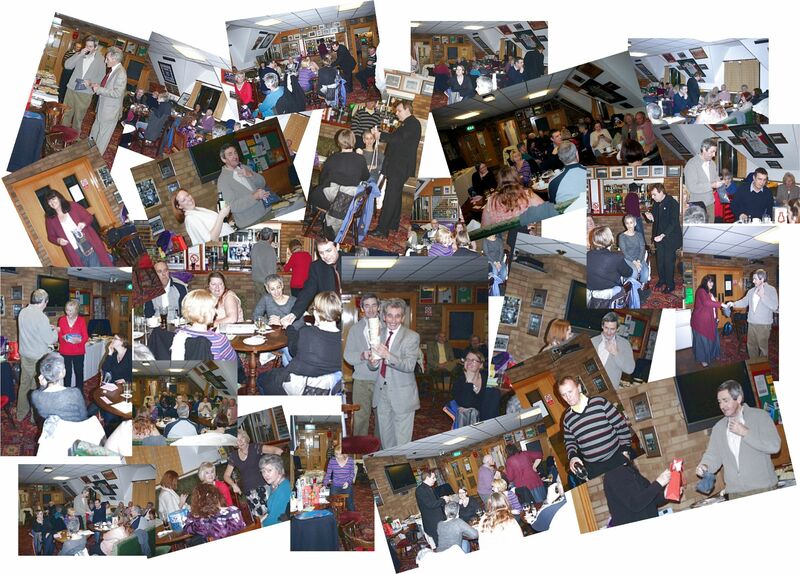 Alan Wells kindly took a number of pictures at the recent Xmas Party which was very well attended. Thanks to everyone who turned up especially the staff. I have been tempted to add captions to some of the pictures but I have managed to resist. 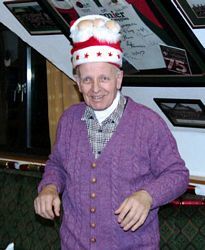 Click on Dave (The Hat's) picture to see all the photos. There will not be a meeting on the first Wednesday in December. Instead the Xmas Party will be on Wednesday the 11th at 7pm. This year we are also able to go back to our previous format where we also had a hamper for a prize. Premier foods have generously donated a number of hampers that Macmillan are distributing on their behalf. We have cadged one and we urge you to dig deep for the extra tickets in order to boost the group's funds. There will be a buffet on offer as usual and following Karen's successful effort last year she will be hosting the quiz again. You are very welcome to bring a guest with you. This is an open invitation to patients, carers, your relatives, hospital staff and consultants. The Rugby Club has a full bar at good prices. Come and enjoy some good company. K-T Martinelli, who most of you will know as the Head and Neck oncology dietician will be stopping by to chat to. K-T was also the driving force behind a campaign to have a soft ice cream machine installed on ward 20 at the L&D where many of you were treated. K-T's visits are always enlightening and her direct and open approach usually gets a good discussion going. More details to follow. Our very own Ian Bridgeman was chosen to take the lead role in an Educational Video aimed at Doctors, Dentists and Pharmacists. The 10 minute video, made and distributed under the direction of the Mount Vernon Trust can be viewed by clicking on the "a star is born" logo. Rob Bunyan leads a discussion on Oral Hygiene and Dental care following treatment for Head and Neck Cancer. If you have questions about dental care following Surgery or Treatment Rob will be happy to advise. Now classed as regulars the Complementary Therapists Team based at Luton's Barnfield College are making another visit to the Rugby Club. Put this in your diary. The therapists are by far the best supported of all our functions. Get there early. It is always busy. 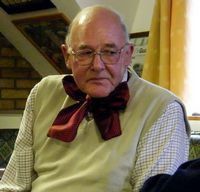 It is with great sadness that I have to report that Keith Foster passed away on the 2nd of March 2013. Keith was a tireless worker and succeeded in bringing about many positive changes that improved the experience for Cancer Patients. There was a Service of Thanksgiving at Ashley Green on the 15th of March which completely packed St. John Evangelist Church. We are working to establish a fitting memorial for Keith and we hope to have news of that shortly. We are happy to announce that the Head and Neck Social Group won a Silver award from the Mouth Cancer Foundation. The Foundation reviews the progress and commitment of Support Groups and their future plans bi-annually . Attached to the award is a �1,000 cash donation to assist in further developing the group. There will not be a meeting on the first Wednesday in December. Instead the Xmas Party will be on Wednesday the 12th at 7pm. A buffet has been arranged. Thanks to Matt�s partner Karen her daughter is organising and running a Xmas quiz for us on the night. There will be prizes for the winning table. We will be holding another bring a prize raffle so please bring a prize wrapped or otherwise so we can raise funds to cover the buffet and a donation to the Rugby Club. (If you don�t have transport let us know we will try to help) Contact Derek web@hansg.co.uk. Many of you will know that in lieu of flowers at Pam�s recent funeral relatives requested that a donation be made to Cancer Research UK. 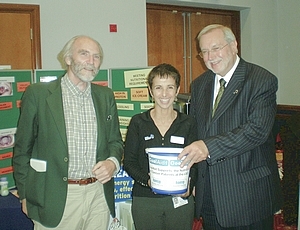 The collection we made at the Rugby Club raised �80.00 which Hugh passed on to Cancer Research. Thanks to you all for contributing. The Pampered Chef fundraiser that Amanda Organised for us went well last Wednesday. We made �54 from the sale of the lo vely cupcakes donated by Carolyn and the raffle. Keith won a �20 voucher. We also will be receiving around �26 commission from sales on the night and I have agreed to have a home party in the new Year. So about �80 made in total, a welcome addition to our funds. As the group has been getting bigger and its operations are becoming more complex Hugh and Derek have been working to prepare a draft constitution for the group. The officers, representatives from the L&D and other committee members also need to be protected from events outside of their control and some basic operational rules need to be laid down. There is a draft document now available Click Here for Word Document. Everybody is encouraged to comment on the draft and make suggestions or objections as they see fit. The timescale is for the first round of submissions to be made by Friday the 23rd of November. At that point depending on the depth of the changes the constitution will be adopted with minor changes or it will be re-submitted for further comment or pea vote if required. It is envisaged that Hugh, as Chairman, will will consider all submissions and take any decisions required for the benefit of the group in total. Following on from Jenny Hunt�s September talk on swallowing problems a number of personal recommendations were made by the members all of which have experienced varying degrees of Swallowing or Taste problems. 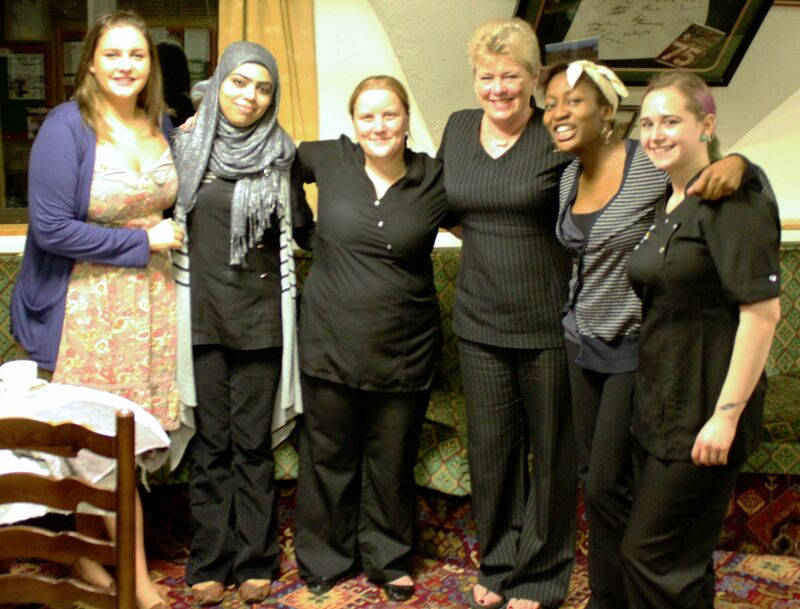 October 3rd � Complementary therapists from Barnfield College. Put this in your diary. The therapists are by far the most popular attraction we have ever had. We all had a great day out on the Canal at Pits tone on Sunday. Twenty one of us, including some relatives and friends, enjoyed some of the best weather we've had this year. The Cruise company were more than fair, they found a few extra public trippers and just charged us for the Twenty One that we had booked. One of the public trippers kindly took the group picture above. I will have some more pictures put up shortly, I have some to process and I k now that Jim has. Anyone else that has a good shot please mail it to me. Hopefully this will be the first of a number of affordable social events. Suggestions are welcome, if you have a trip that you want to organise let me know. Marisa Richards (Commissioning Manager NHS Beds and Luton) will be addressing the Group at the 4th of April Meeting. Marisa is interested in the group�s views about Radiotherapy. Marisa would like to get the views of those who agreed to Radiotherapy and also those of who chose not to. She is also interested in topics such as the options you might have been given by your consultant and how the journey time might have affected you decision to attend. Please turn up and participate in the discussion. Your views can affect the policy and the outcome for future patients in this region. As we reported before the Day Room alongside Wa rd 20 is being used for Head and Neck Members to meet with current patients. Whilst it was a nice quiet space it was a typical Hospital Room with poor furnishings. 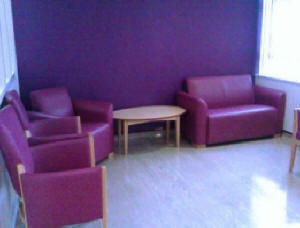 The room has now had a great makeover with input from the Head and Neck Cancer Nurses. Amanda Naylor has sent over the latest picture. I'm sure anyone who has used the room in the past will immediately notice the difference. Fiona Ritchie will be answering questions, offering hints and tips relating to dry mouth and oral care. Fiona works for RIS Products Ltd www.risproducts.co.uk promoting a oral healthcare products which are particularly relevant to Head and Neck Cancer Patients. Fiona Ritchie doubles as project manager for Christine Piff Letsfacit support network for people with facial disfigurement www.lets-face-it.org.uk. Fiona previously accompanied Christine on her visit to the Head and Neck Support Group�s meeting in November. Louise Bolton who is a Macmillan Primary Care Oncology CNS will be along to tell us about �The Cancer and Exercise pilot which is starting this month. Active Luton and Macmillan are working together to look at exercise that can be offered to cancer patients during treatment as it is shown to improve or prevent the decline of physical function without increasing fatigue. Louise would like to take the opportunity to explain the pilot scheme and hear what exercise patients might like to take part in either individually or as a group. Louis will also explain how to obtain an assessment to join the pilot or how attend drop in centre for further information. 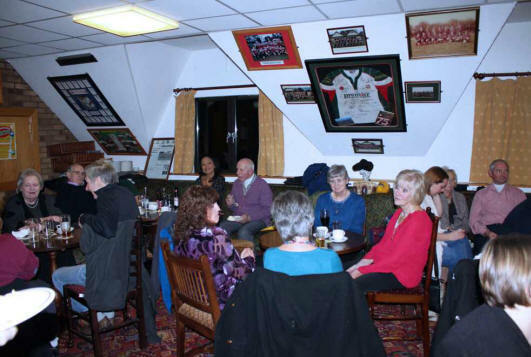 Thanks to everyone who came we had another great Xmas Party at the Rugby Club this year. Thanks in particular to those who bought a prize for our raffle the sale of tickets raised �125 which very nearly paid for the catering. As a thank you for hosting the monthly meetings (at no charge to the group) we made a modest donation to the Rugby Club on behalf of all of us. I think a special mention should also go to Keith who many of you will know has required some surgical maintenance over the last couple of weeks. He is now back home and doing ok. I�m sure you will all join me in wishing him well. Don�t forget we will be back at the Rugby Club January 4th Please make it worthwhile for the Rugby Club to open the doors. Merry Xmas and a Happy New Year. It's that time again and the Head and Neck Social Group would like you to be our guest and join us for a drink and a buffet at our Xmas Party Wednesday December 14th. 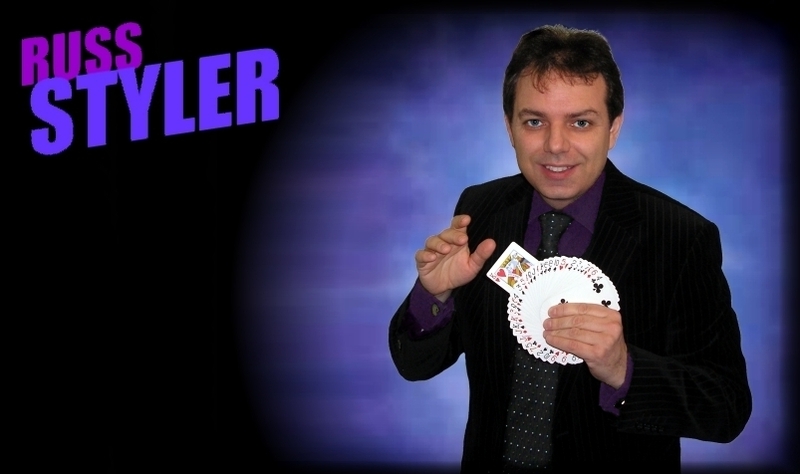 This year we have splashed out on a floor show and we have booked Russ Styler who will tour the tables and perform magic close up. You are very welcome to bring a guest with you. This is an open invitation to patients, carers, relatives, hospital staff and consultants. There will also be a Raffle on the night to raise funds please would you bring a prize. The Rugby Club has a full bar at good prices. Come and enjoy some Good Company. (If you don�t have transport let us know we might be able to help.) Contact Derek web@hansg.co.uk. Being diagnosed and treated for Head or Neck Cancers is a difficult time for anyone. Members of the L&D Head and Neck Cancer Social Group have pioneered a new service that makes two members available each week to advise and support recently treated patients. The system works with the assistance of the Head and Neck Specialist Nurse Carole Glover and Jenny Hunt Speech and Language Therapist. The Group is organised into teams of two who make themselves available on a rota system. Visits are not required every week but when they do take place they are received well. The team have all been vetted with the assistance of the hospitals volunteer service and report to the ward management on arrival. We are fortunate to have a good size day room where the group can base themselves. The system has been operational since the beginning of Summer and we will be looking at the results of their efforts in the new year. If you wish to start a similar scheme or have questions regarding its operation please mail web@hansg.co.uk. Thanks to Lets Face It founder Christine Piff and Fiona Ritchie we had a very good meeting in November Christi ne proved to be a very positive role model for victims of Head or Neck Cancer. It was a great presentation and we have asked Fiona to come and talk to the group about dry mouth sometime in the future. On Wednesday 2nd of November Christine Piff Founder/Chief Executive and Project Manager Fiona Ritchie both of Lets Face It have been invited to talk about their work. in the loss of half her face, including the left eye. despair that living with a 'changed' face brings. Fiona Ritchie will be on hand to offer advice on managing the symptoms of dry mouth. As ever the Barnfield team put in a real effort to make the evening another great one. Saturday 17th and Sunday 18th saw the 2011 Relay for Life weekend of entertainment and fundraising for Cancer Research UK take place at Stockwood Park Luton. 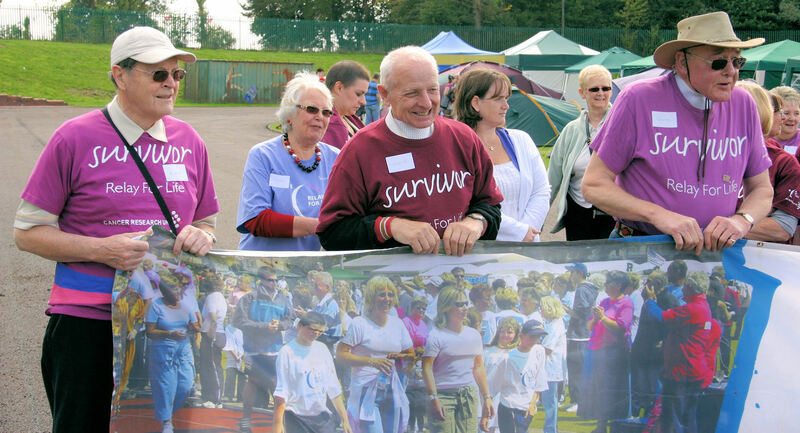 If you have never been to Relay you are missing a great party in the park and a chance to support sponsored teams of walkers making a 24hour assault on the athletics track to raise funds for Cancer Research. Both the organisers and the teams put on sideshows and all kinds of entertainment. Best of all its a party atmosphere. There is always a very professional stage and this year was no exception with some excellent music, singing, excerpts from musicals and even a choir. 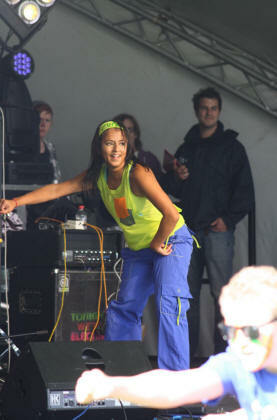 The more energetic joined in for a long Zumba workout on the grass to some good music. See all our pictures Click Here. Jim Lucas and Derek Tidman had a great day out with the Maxillofacial team at the Redbridge Cycle Centre in East London on Saturday the 3rd. Click the team picture for a page of photos of the day. It's not to late to donate just follow the link on the page. Chi-Hwa Chan Consultant Oral and Maxillofacial Surgeon at Luton and Dunstable Hospital has co-opted a team of clinicians from the L&D, Bedford and family to raise money for Saving Faces. The team will have their fitness tested on Saturday 3rd September at the Redbridge cycle centre in Ilford. The team also aims to raise at least �500 to pay for a statistical analysis of the outcome of the treatment of every mouth cancer patient treated in their unit over the past 9 years. The statistician who will conduct the review works at Mount Vernon Cancer Centre and she has offered to donate the money she receives to the Mount Vernon Research Fund! This vital information is not currently available. The outcome of treatment is of paramount importance in order to modify and improve service to patients. 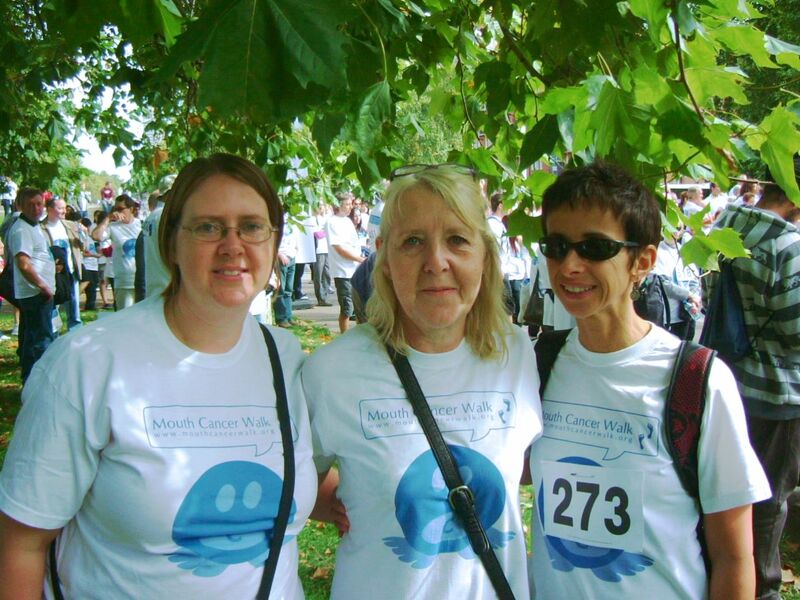 There are a limited of grants available for members of Head and Neck Cancer and Laryngectomy support groups to attend the annual Mouth Cancer Walk in Hyde Park London. The Mouth Cancer 10 KM Walk is designed to increase awareness of head and neck cancers, celebrate survivorship, create an opportunity to meet friends, remember lost dear ones, and also have a fun day! Everyone�s Invited. 13.00 arrival 14.00 walk. Last year Amanda Naylor (Head and Neck Support Nurse) her Husband, K-T Martinelli (Head and Neck Macmillan Oncology dietitian) and Susy Smallbones (ENT Nurse Practitioner) raised �700 at the event. Summer is here and to celebrate we are throwing a welcome party to encourage new and existing members to attend. There is no charge just bring yourself and a friend if you wish. June Meeting is the Second Wednesday due to a prior commitment at the Rugby Club. Raising money (the hard way). All the pledges have been called in and the moneys now been collected Aran, Connor, Sam and Seb raised an amazing total of �5,094 which is a great result. John Pickles (the L&D's Medical Director) took time out to accept the cheque on behalf of Ward 20 at our June Meeting at the Luton Rugby Club. Raising "Loads of money (the hard way)"
Due to the varying commitments of the team members the Ironman Half-Triathlon took place at short notice on the 10th of April. James Lucas was on hand to see them finish. "Everyone seemed to enjoy it, surprisingly nobody looked exhausted, estimated timings for each stage were pretty close except for 2 punctures on the cycling stage. We shook a bucket at the swimming pool which ended up with a few pence under �100 and another was shaken at the pub that looked fuller but hadn't been counted. A quick peek at the just giving page has a tally over �2800 @ 56% of target and the text and puns have been amended to announce that the boys completed their challenge with the page being kept open for another month." This severe test of stamina and determination was in order to raise funds for the Luton and Dunstable Hospital, Head and Neck Cancer Unit. Anil Garcia will be attending our April meeting to get your views and to pass on what's been learnt to date. Vocational rehabilitation has been described as a process whereby those disadvantaged by illness or disability can be enabled to access, maintain or return to employment, or other useful occupation (British Society of Rehabilitation Medicine, 2003). The Cancer Reform Strategy, recognised the needs of, and lack of services for, people living with the side effects and long-term consequences of cancer treatment. As a result of this, the National Cancer Survivorship Initiative (NCSI) was established, led by the Department of Health and Macmillan Cancer Support. A project group was set up to review the provision of vocational rehabilitation and develop a vocational rehabilitation service model that could be piloted. Mount Vernon Cancer Network is a pilot site for the development of a Vocational Rehabilitation Model and work is now underway to discover the availability of employment support for people after a cancer diagnosis, the information available to staff to enable them to answer queries and concerns, and to employers to enable them to support their work force effectively. Feedback is being sought from Patients and Carers on their experiences of getting back to work to enable the production and availability of effective and supportive help. If you would like to take part in this project and have experiences that you feel could help plan for the future please contact the project lead on the details below. Feedback can be given either by Phone, email or Face to Face. It's that time again and the Head and Neck Social Group would like you to be our guest and join us for a drink and a buffet at our Xmas Party Wednesday December 15th. Liza Pheazey will be running a Prize Quiz. The Rugby Club caterers are supplying the Buffet. There will also be a Raffle on the night to raise funds. The Rugby Club has a full bar at good prices. Come and enjoy some Good Company. Raising money "the hard way"
On the 22nd of December Sam Hunt and three friends will attempt to complete an unofficial Ironman Half-Triathlon in the Luton Harpenden Area. This severe test of stamina and determination is in order to raise funds for the Luton and Dunstable Hospital, Head and Neck Cancer Unit. Sam will be along to the Head and Neck Social Group Meeting on the 3rd of November to tell us all about the challenge and what it takes to prepare for it. 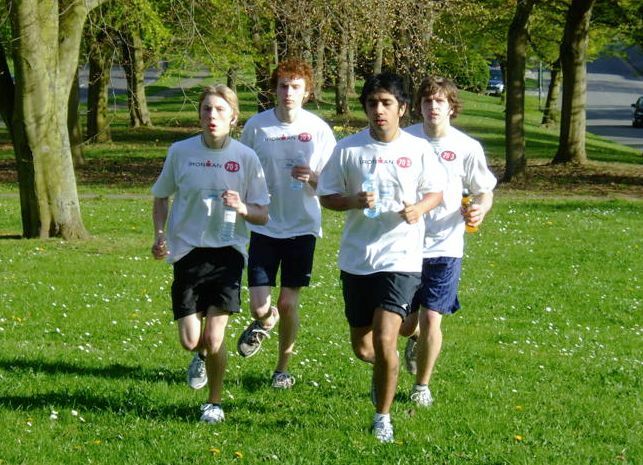 Connor, Sam, Aran, and Seb have set up a just Giving Page http://www.justgiving.com/halfironmen. For those of you who don't know Just Giving is safe secure way of giving that also credits the charity with a tax rebate on all donations given by UK Taxpayers. (Just Giving do not sell, use your details or send unwanted emails. Raising money "its a Walk in the park"
To mark t he countdown to Mouth Cancer Awareness Week between 14th and the 20th November 2010 the annual Mouth Cancer 10KM Awareness Walk took place in Kensington Gardens London on the 18th of September. This year Three Members of the Head and Neck Team at the Luton and Dunstable Hospital completed the 10k walk. 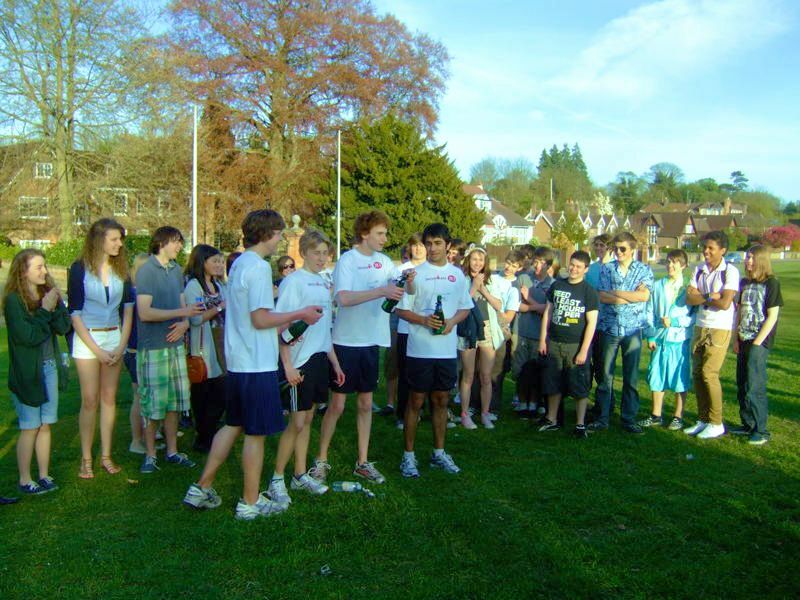 The sponsored walk attempts to raise awareness of mouth cancer. Those of you who have been treated at the L&D will alread y know the hospital�s head and neck oncology dietician Katrina (K-T) Martinelli. K-T has been the driving force behind a campaign to have a soft ice cream machine installed as part of the specialist cancer unit. The machine has now been installed on the ward and is providing high calorie, high protein food to patients. As many readers will already know head and neck cancer sufferers often have difficulty eating especially just after treatment. The money to purchase the ice-cream machine was donated by head and neck cancer patients and the hospital will underwrite the future maintenance costs. Patients from the Cancer Service users and the Head and Neck Cancer Support Groups are backing the introduction of the ice-cream machine and will be promoting its use in the hospital. Although its a simple idea the beneficial impact on patients cannot be underestimated. We hope this initiative will be rolled out elsewhere as it deserves to succeed. The media also liked the idea with a TV crew turning up to talk with K-T and Ronnie Barbour inviting K-T on to the Nine on BBC 3 Counties. K-T turned in a great performance, which if you didn't catch, can be played in Windows Media Player from this site by clicking here. K-T and Ronnie. It will take a little time to load. Contributions to support the maintenance or towards further machines would be welcome. If you wish to contribute you can email the Treasurer of the Head and Neck Social Group for details. 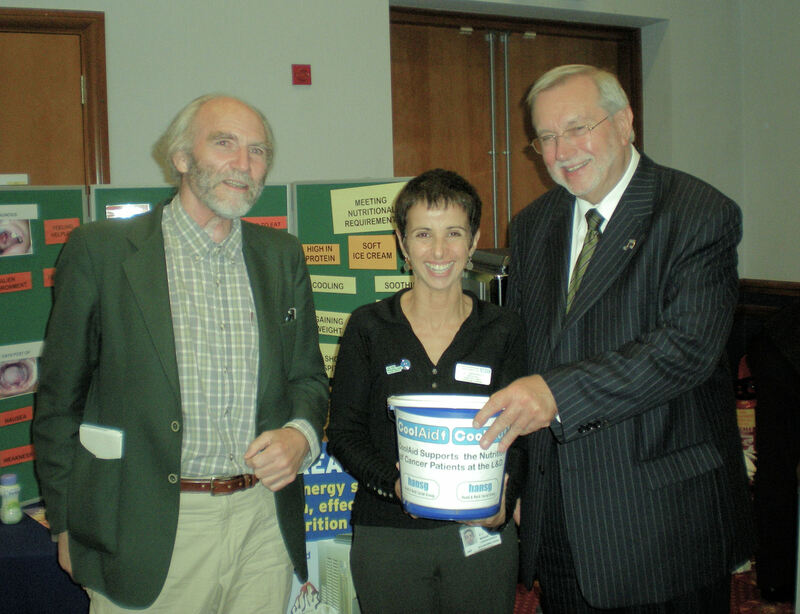 K-T took the Ice Cream Machine to the Foundation Trust's Annual Members Meeting on 20th September. K-T is joined here by Spencer Colvin Chairman of the L&D and our very own James Lucas representing the Head and Neck Social Group. Spencer Colvin is an enthusiastic supporter of K-T's CoolAid Project to improve the nutrition of Head and Neck Cancer Patients. Hansg didn't miss the opportunity to rattle a tin for the CoolAid Project and we raised a few pounds towards maintenance of the machine. To confirm the Head and Neck Social Group's support for K.T's Ice Cream project we are pleased to announce the formation of CoolAid. CoolAid is the collective banner under which we hope everyone will come together to raise funds and awareness for K.T's project. Luton Rugby Club be the first fundraisers to use the new logo at their Hawaiian Night on Saturday 30th of October. We had another great day at the Luton Relay for Life event in Stockwood Park. Even though the weather in mid September can be variable the rain mostly held off and the sun shone on the Saturday. Six or seven of us turned up from Hansg along with a few other faces that we recognised from other support and fund raising groups. As usual Susan Blee was racing around forcing the whole thing to work. As the picture will attest, its almost impossible to stop her for enough time to tak e her picture. 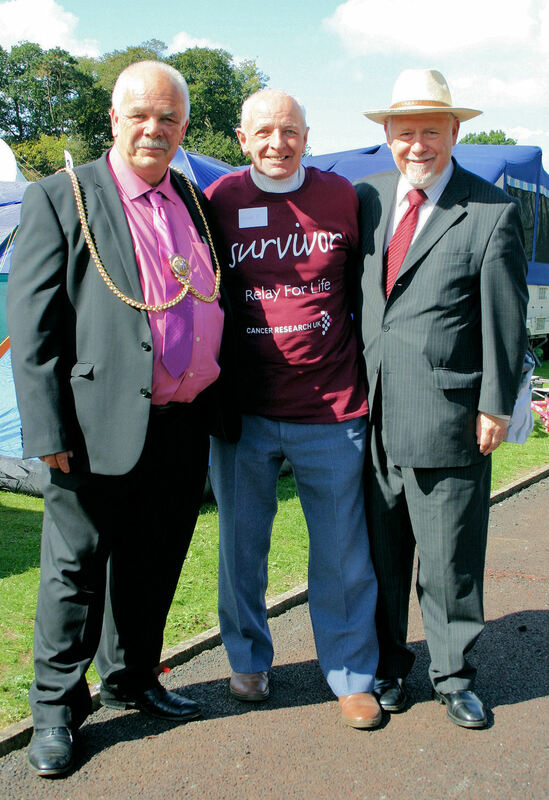 As has become a tradition for Dave and I we managed to get another picture of Dave with the Mayor and Kelvin Hopkins the local MP. Click on any picture and it will take you to the collection where you can click on any thumbnail to see the full size pictures. Luton Rugby Union Football Club have confirmed their commitment to the Head and Neck Social Group and the CoolAid Project which is the clubs chosen Good Cause for the season. Alongside their own Club development fundraising, Luton Rugby Club will also use its events program to raise money for CoolAid. The first of these events will be a Hawaiian Night, to celebrate the beginning of the season and the end of summer. Taking place on Saturday 18th of September 2010 the night will commence directly after the 1st XV match versus Hereford at Newlands Road, Luton. All supporters will gain free entry and parking, bars open at Midday, game kicks off at 3pm. The Club will be pre-selling wristbands for the Hawaiian Night wristband wearers will benefit from special prices at the bar. Wristbands will be available at �5 this week at the club and at the match on Saturday. With a live band starting at 5pm, food and full bar available throughout the night, a great evening is predicted. The second event will be held on Saturday 30th of October, with details for this event being confirmed within the coming month. For further information please contact the Luton Rugby Union Football Club Office on 01582 720355. All of us have been diagnosed, treated or have cared for someone who has suffered from Head and Neck Cancer. Some of us still have our sense of humour; some of us have even retained most of our intelligence. Some know how to cook, fix cars, sew, weld, paint and decorate, plumb, garden and possibly how to milk cows. We can be grumpy sometimes, irritable at others. Sometimes we hate not being able to eat what we want. Other times we hanker after the way things used to taste. Occasionally we can be entertaining and good fun to be with. We all have experience that we are happy to share. We all understand what its like to be launched back into the world with the collateral damage caused by surgery and radiotherapy. We don�t really do that much, we meet, we often have a guest who has a relevant skill and we chat for a bit. Most of the time we just sit around getting to know each other. What we would like is for you to join us so that we can have a bigger and better group. In order to make the group a little more social we have moved our venue to The Luton Rugby Club which is close by J10 of the M1. We made the move to somewhere with a bar (coffee is also available) because we know some people just don�t like hospitals. Our venue is a quiet private bar at the club where we can socialise or have presentations without being disturbed. We can be a big help to those of you just coming to terms with the speed and savagery of what happened to you and in return you can help us grow into something worthwhile. If you are a carer you are welcome to come along with or without your charge and see how we can help. If you have been treated elsewhere you are still very welcome.